Nutrition is an important, and often overlooked, component of a student-athlete’s success. 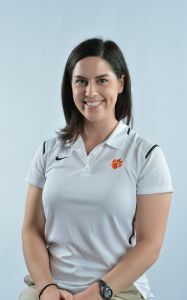 Clemson University houses four full-time sports dietitians to assist Clemson student-athletes in their quest for success in both academics and athletics. Being adequately fueled can assist student-athletes in their ability to practice and train at their best, and keep them focused in the classroom and in film sessions. Proper nutrition can ensure student-athletes have the nutrients available should an injury or illness occur, preparing them for a quicker, stronger recovery. Focusing on a daily performance diet can keep Clemson student-athletes fueled, healthy and ready to take on their competition. Clemson University Sports Nutrition is a division of the Clemson University Athletic Department’s Student-Athlete Wellness & Development department that focuses on taking a holistic approach in the care of the student-athlete. The Clemson Sports Nutrition Department educates, counsels, and fuels Clemson student-athletes utilizing best evidence-based practice to promote optimal athletic and academic performance, injury prevention, and overall health and wellness now and in the future. The Clemson University Athletic Department emphasizes “academic, athletic, personal, professional, and social development excellence” of the student-athlete and the Clemson Sports Nutrition Department plays an important role in achieving that standard. 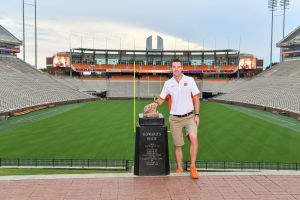 The Clemson Sports Nutrition Department is a part of Student-Athlete Wellness and Development, a department that thrives on taking a holistic approach in the care of the student-athlete. Nutrition is an important, yet often overlooked, component of a student-athlete’s success. Being adequately fueled can assist student-athletes in their ability to practice and train at their best, and keep them focused in the classroom, film sessions, and other programs. Proper nutrition can also ensure student-athletes have the nutrients available should an injury or illness occur, preparing them for a quicker, stronger recovery. The Clemson Sports Nutrition Department strives to provide student-athletes with valuable nutrition knowledge via individual counseling, team educational presentations, handouts, and/or e-resources to assist them with: choosing foods for optimal athletic performance; eating well for greater concentration in the classroom; consuming foods that assist with injury prevention and/or recovery; cooking and shopping skills; supporting body composition goals to optimize performance and promote health, individualized to each student athlete; making informed decisions regarding supplement use; and overall understanding of how nutrition affects health, wellness, and athletic performance. Our goal is to support Clemson student-athletes with education and fueling assistance during their time at Clemson, while also teaching these valuable lessons that they can use for a lifetime. Encouraging Clemson student-athletes to take ownership of choosing foods to fuel their athletic and academic performance; enjoying a nutritious, balanced diet; and creating a healthy relationship with food are our main objectives.